MDM Landscapes will provide weekly residential lawn mowing in Dallas-Fort Worth, TX for whole residential developments. If you are part of an HOA and want complete lawn care and maintenance for your residential development, contact us today calling 817-396-0125. Mowing properly is one of the most crucial factors in a healthy lawn. Like most plants, grasses branch out and become denser when their growing points are clipped. For grass, the growing point lies in the crown, where new growth appears. When a field of grass continually branches out and becomes denser, it turns into a tightly woven mat of turf, which we then call a lawn. If left unchecked, a front yard would appear more like a natural field than a traditional lawn. How high you leave your grass, and how frequently you mow, help determine the health and appearance of your lawn. It’s important to remember that mowing is stressful on the grass, and a proper interval is necessary to allow recuperation and regrowth. For residential lawn mowing for your Dallas-Fort Worth, TX residential development, call us today! Frequency: Grass needs time to recuperate after each mowing, and constantly mowing can have detrimental effects on the health of your lawn. 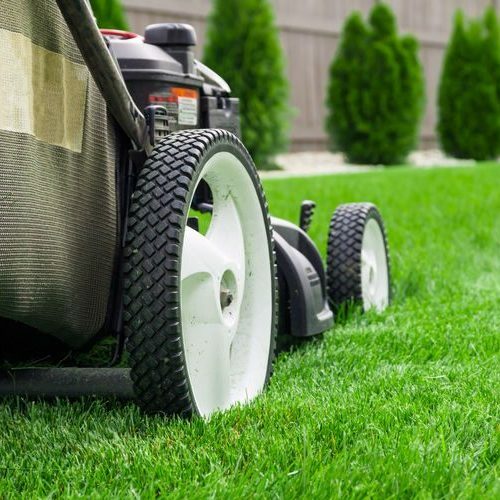 Once a week is a good rule of thumb, as this allows time for new growth to develop without letting the grass get too ahead of your mowing schedule, allowing you to keep your mower adjusted to the same height. Following the “one-third” rule of never removing more than one-third of the blade in a single mow and adjusting the height of the mower as necessary after heavy rains, will also help to ensure your grass remains healthy. Height: Many species of grass have a range of recommended heights for mowing. Leaving the grass as tall as possible for the recommendations of that species will help to ensure optimal health during stressful conditions like droughts. Grass can typically be cut shorter in cooler temperatures. MDM Landscapes will happily perform regular mowing to ensure it’s kept within the parameters of residential development and HOA guidelines, and we will always keep it looking as healthy and green as possible! If you need residential lawn mowing in Dallas-Fort Worth, TX, feel free to contact us at 817-396-0125. We are your premier lawn care and other landscaping service professionals in the DFW area. Updated on March 8, 2019 at 11:48 am by MDM Landscapes.